The top section consists of a moulded cornice to the top with carved ball decoration, this being a very unusual feature, leading down to a fluted frieze concealing a secret frieze drawer to the front of the chest. This leads down to the drawers which consist of two short over three long finely figured mahogany drawers of exceptional colour, all cockbeaded and oak lined with brass swan neck hands (these not being original, probably replaced at some time due to fashion changes) and brass escutcheons. 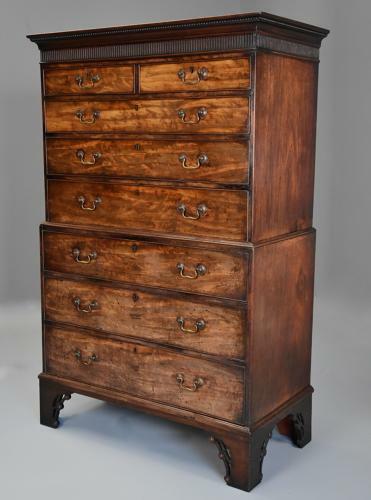 The lower section consists of a moulded edge to the top leading down to three graduated deep finely figured drawers again of exceptional faded patina, also all cockbeaded, oak lined and with swan neck handles and escutcheons. The chest is supported on a base with a moulding to the top leading down to four tall pierced bracket feet (these not being original, the four feet having been replaced due to severe damage and copied from the original design). The ends consist of finely figured faded mahogany and the back of pine boards. This chest on chest is in very good condition for age, is of stable construction and can go straight into a home and a super piece for storage.